Resuming a project that was previously cancelled or put "on hold" is a risky activity — cancelled or paused projects are often troubled. By addressing the issues of politics, finance, technology, team building, and infrastructure, this tips book gives the leaders of resuming projects a substantial edge. You face a critical decision. Bookings are up, costs are down. Business looks like it's improving, and prices of critical technologies have fallen. That big project you cancelled in 2014 is still a good idea, and you still want to do it. But should you start from scratch or is there a way to pick up where you left off? Tough questions. Here are just a few of the issues: How much would it cost to start from scratch? How much to resume? How do we get the team back together now that they've scattered to the four winds? What do we do about the political questions? How do we win over the people who got it cancelled back in 2014? As the manager of a resuming project, or as someone who'd like to resume a cancelled or paused project, you face problems that differ markedly from the more familiar problems of a startup project, or even a continuing project. You must master the politics of resuming a project, of course, but that isn't enough. Once you get underway you'll face problems that you'll never see in a startup or continuation. For example, if the project was formally cancelled, many of its assets, both human and not, have scattered. Putting them back together again can be a costly endeavor, entailing risks that a startup project or a continuing project never faces. 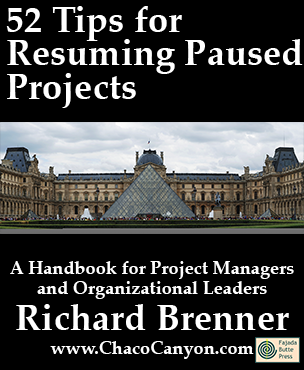 52 Tips for Resuming Paused Projects is an ebook packed with ideas that project managers and leaders of project-oriented organizations can use right now to address the special problems of resuming paused projects. While the project was cancelled or paused, certain expenses, such as vacation and sick time, leases and space charges, which would otherwise have been charged to the project, might have been charged to other accounts. When the project resumes, those accrued charges might suddenly appear in the new project's accounts. Gain commitments that this won't happen, but watch for it anyway. People who ordered this item also ordered How to Spot a Troubled Project Before the Trouble Starts and 52 Tips for Leaders of Project-Oriented Organizations.In most projects, documentation lags implementation. When you resume a project, relying on its documentation is therefore risky, because it usually doesn't reflect the state of the project at the time it was shelved. Review all documentation for consistency, completeness and correctness. Flag anything that's dubious. In an ongoing project, completed items tend to remain static, even when we later discover better approaches. In a resuming project, we have a greater tendency to reconsider and redesign things "while we're at it." Watch carefully for this tendency, and maintain enough discipline to make only necessary changes. 52 Tips for Resuming Paused Projects is in Acrobat format, which gives you several advantages. You can print it, and read it like any book. Or in electronic form, you can use the search capability of Adobe Reader to find passages of special interest to you. If you load it onto your laptop, tablet, or other mobile device, you can read it anywhere — and it's weightless, too. 14 pages.